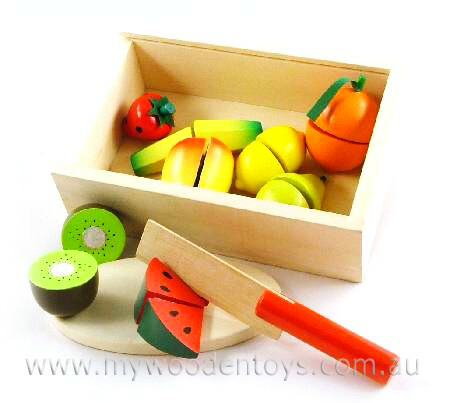 Play Food Cutting Velcro Fruit Box contains segmented pieces of fruit connected together with Velcro. They can be cut apart with the red-handled wooden knife. This set contains eight pieces of delicious fruit in lovely colours, one knife and a chopping board. This is a great toy for stimulating an interest in fractions as your little one divides Bananas and Watermelon. Beautifully finished in a lovely smooth wooden box with a sliding perspex lid this is a well made solid toy. It provides a really fun way to learn the names of fruit and this box has a good range. One Banana, Orange, Watermelon, Apple, Pear, Lemon, Strawberry, and a Kiwi Fruit. Material: Wood, Child -safe paint, Velcro. We like this because: "It allows little ones to practice cutting without any danger."